The illustrated Leatherman Tool is the Leatherman Wingman Tool that features stainless steel construction with spring action needlenose pliers, spring action regular pliers and wire cutters. 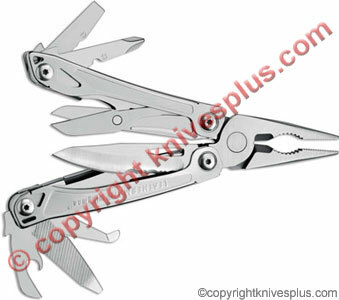 The stainless steel handle of this Leatherman tool, 3.8" closed, has locking outside blades. Functions include a 420HC stainless steel part serrated blade, a package opener, a wood/metal file, scissors, small and medium screwdrivers, a Phillips screwdriver, a bottle opener, a can opener, a wire stripper, inch/CM rulers and a removable pocket clip. The Leatherman Wingman Tool weighs 7 ounces. This item is discontinued and out of stock - it is left for reference only.